Driving the project portfolio with a focus on impact and strategic business benefits. 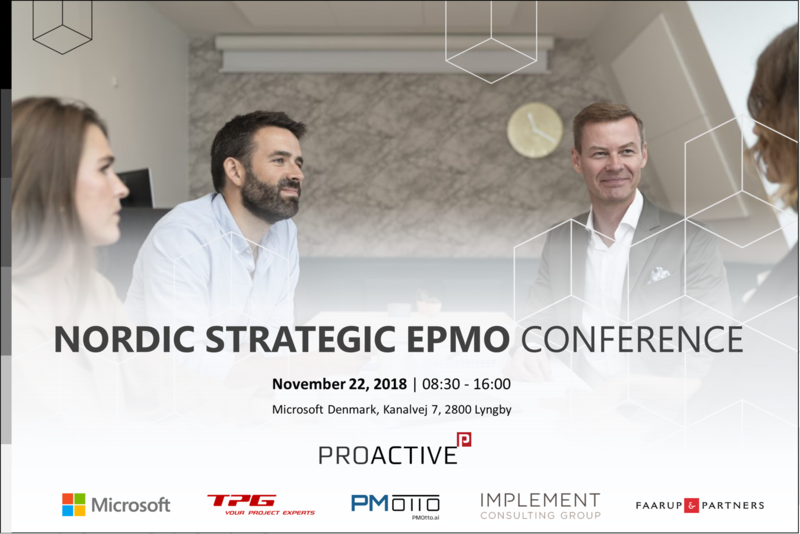 Join us for an inspirational day where some of Denmark’s biggest players within their industry explain about how they optimize the strategic value of their project portfolios with the top of the class technology solutions. Allan Rocha will give a warm welcome to #NSEConference | Nordic Strategic EPMO Conference and a quick overview of the entire event. Learn more about our Nordic Strategic EPMO Community and join us. How are we able to deliver a double impact in our Portfolio? Is the math wrong looking at our portfolio today or do we fool ourselves counting and creating business cases instead of focus on Impact, Flow and Leadership? Lars Gormsen is telling his story coming from “traditional” Portfolio management with all the “balancing and arguing” about resources and going towards another approach in a new paradigm where strategic impact and “own it or leave it” are the pathfinders. Managing a portfolio where “only the best is good enough” when it comes to global and local projects requires a well-defined process in combination with a robust solution that can act as the “Single Source of Truth”. Jan Dannesboe and Katerina Karaflou will tell more about their journey of re-imagining the way LEGO’s Global PMO will run their projects for the future while enabling users to work in a modern and collaborative environment. Learn how to implement a modern and effective workplace. When is the right time for resource management and its benefits? Building a solid roadmap and giving the right time for users to embrace new technologies are crucial steps while preparing to implement Resource Management in your organization. Keith Bollington and Angela Daniel will give their secret and successful recipe for an effective resource management solution that helped ROCKWOOL optimize their resources’ utilization across teams, departments and regions while enabling improved portfolio prioritization aligned to strategic values and drivers. Keith Bollington and Angela Daniel are back after the great success of last years session “Scalable PPM: From small to big implementations” where they presented how to manage your organization to gradually embrace technology and control expectations among users while providing a solid roadmap that helped several other organizations in the same journey. Get a clear understanding of your projects’ benefits throughout their entire lifecycle. Henrik Faarup will show how his methods and tools combined with Microsoft Project Online helped ROCKWOOL build strong and realistic project business cases. What are the challenges and benefits of implementing time and task management in a Research and Development department, where innovation is key to success. Join Lise Berg Kildemark to learn about important factors that enabled ARLA R&D employees to work with a better, easier and clear time registration process based on an easy-to-use interface. Single-source is key to report working and non-working time, having the ability to capture projects, operations and administrative time and at the same time obtaining scalability for the entire enterprise. In this presentation, we will first introduce the company and the main requirements for our project management in R&D. When we built the new Global Project Planner (GPP), we had among others a strong focus on integration and reporting. In our presentation, we will depict how the tools are being used properly by the various user-roles, which was key for enabling the requested functionalities. We will then show how we solved our requirements for integrating with SAP PS, SAP BW and other third-party applications. And finally, we will point out some key elements of our reporting, especially our swim-lane and Pipeline reports, which are automatically created in PowerPoint(! ), adding a remarkable value to our management reporting. We are taking a look at the future ways of working with project and portfolio management in the public sector by the case of Ishøj Kommune. A simple to-go-to tool for project managers and a clear portfolio overview for decision makers is crucial also in public administration. Linne Caramés shares her view on the prospects and constraints of digital transformation in a Danish municipality. Can you imagine having a personal virtual project management assistant, available 24 hours a day – 7 days a week, helping you manage your projects, tasks and resources? Learn how to drive more adoption among your users by providing them with a personalized chat-bot assistant. Angela Daniel will tell her challenges and learnings after using her personal virtual assistant while running a real PMO. Allan Rocha brings the technical perspective that allows today’s organizations to take full advantage of cutting-edge technologies like intelligent chat-bots fully powered by artificial intelligence and machine learning algorithms. Join our consultants to have a look at our various customer solutions.